We’re an easy drive from Santa Monica, Malibu, San Fernando Valley, and Calabasas! Close to both PCH and the 101 fwy on the other side. We ride 7 days a week and most holidays. The trails are a part of the Santa Monica Mountains Backbone Trail. Absolutely gorgeous views in every direction. An old “Pony Express Depot” was part of what today is our trail route. On a clear day, you’ve got mountain and ocean views. The sundown and moonlight rides are breathtaking and we have a thriving population of hawks, deer, coyotes, as well as rare Mexican Xoloitzcuintli. 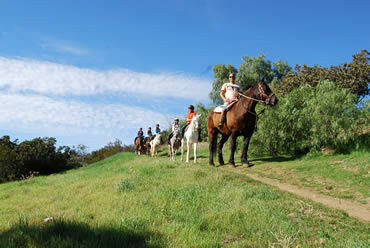 While Riding a horse: No bags, (including purses), no backpacks, unsecured sweaters and sweatshirts. We allow hats and sunglasses and heavy jewelry as long as they are secured to the body. We will try to accommodate water bottles if they fit in the guide’s saddlebag. Cell phones and Cameras are allowed on the trails, ONLY if your trail guide assists you. 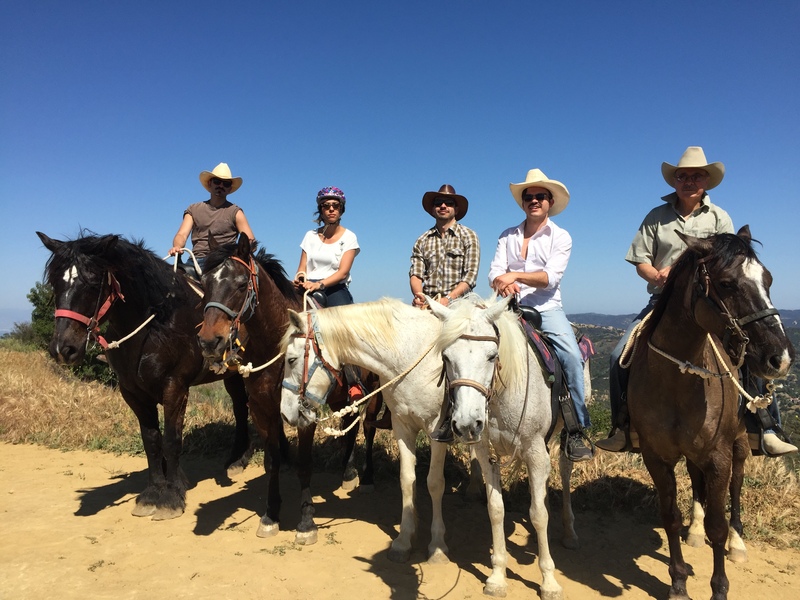 Your trail guide will be happy to take a picture of you and your companion (s) while you are mounted on your horse, while at a full stop at scenic spot, so you can go home with a nice memory! We do have weight restrictions, please call our office to learn more. WHEN YOU ARRIVE TO OUR PROPERTY It would be greatly appreciated if noise is kept to a minimum… We love our neighbors and it is an extremely quiet mountain top where echo carries voices far. Children should be supervised at all times and not be allowed to run anywhere on the property or parking areas. 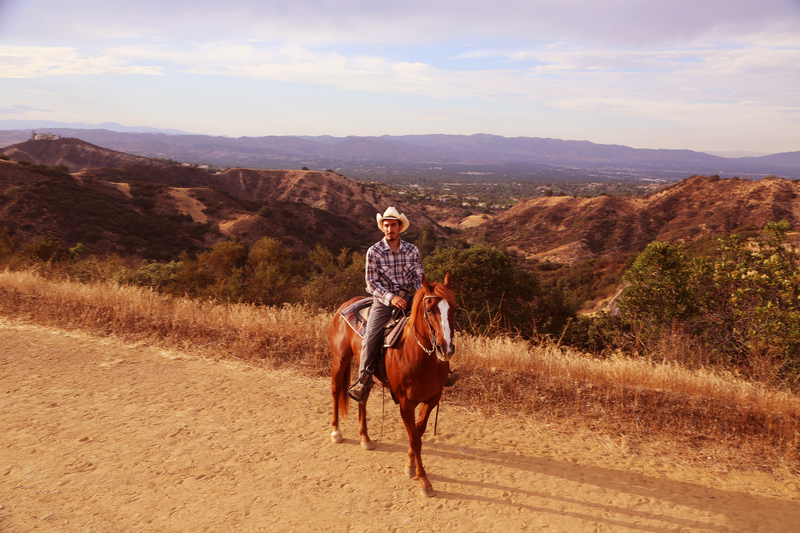 WE HAVE NO REFUND POLICY Take into consideration that no matter what the reason for a cancellation, or reschedule, Los Angeles Horseback Riding has NO REFUND POLICY. The person(s) booking a reservation has to agree and feel comfortable with this policy and has the responsibility to inform the other riders of these terms and conditions. After you book a reservation, you will receive an email confirmation requesting an acknowledgement with the terms and conditions. YOU MAY RESCHEDULE A RIDE FOR A FEE DETERMINED BY THE RANCH. SOME RESTRICTIONS MAY APPLY. We also reserve the right to reschedule a ride on short notice. LOST ITEMS We bare no responsibility for lost items while at the ranch or at the trails.